The biggest horse in the US rolls around this weekend, with the 138th edition of the Kentucky Derby taking place in Louisville, Kentucky. The ‘most exciting two minutes in sports’ is run over one and a quarter miles and is the first leg of the US Triple Crown. Last year’s race was well won by I’ll Have Another, and this year’s race is expected to provide another close run thing. The favourite’s tag has already shifted hands in the betting this week, with Verrazano and Orb trading places, but there is little to choose from between these two horses. The best place to have a bet on the 2013 Kentucky Derby is with Bet365.com, which is where you will find the best odds for betting online. Bet365.com will also be offering an each-way option, with which you will be paid out at 1/4 should your selection finish in positions one to three. Verrazano started the week off as favourite, and it is not difficult to see why. He has won in all four of his starts, and the colt comes from a rich Derby-winning heritage. His last race was in the Wood Memorial, a race that has provided four of the last 20 Kentucky Derby winners. Having said this, there must be a reason why his odds have lengthened during the course of the week – outside of the competitiveness of his opponents, that is. The caution seems to be around the fact that, although he won in that Wood Memorial, it wasn’t as impressive as it perhaps might have been. That day he won over Normandy Invasion, who is at 8/1 for Saturday. Many feel he should have won that race by a larger margin than by just under a length, and his lack of running experience might scare off some punters. Nonetheless, he must be one of the race’s prime favourites. One of the reasons why Verrazano’s odds have lengthened is the form shown by his main opponent, Orb. Orb, too, has won his last four races, the last of which was the impressive win in the Florida Derby, a race that has provided the winner of the Derby on five occasions in the last 20 years. He triumphed convincingly over Itsmyluckyday (12/1 for Saturday) in that race, and looks to be on top form going into the Derby on Saturday. The majority of the focus has been on Verrazano and Orb this week, which is not to say that the rest of the field does not present any possible victors. Goldencents, trained by Doug O’Neill, who trained last year’s winner, won the Grade 1 Santa Anita Derby a couple of months ago and comes into the race with some good form. Revolutionary, likewise, has been showing an improvement in form during the spring season and it will be interesting to see how he runs this Derby. 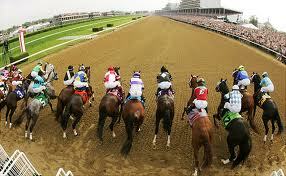 Check out this race preview for further Kentucky Derby race betting strategies. Bet365.com is the ideal racebook to place a bet on the Kentucky Derby. When visiting Bet365.com, click on ‘Horse Racing’ in the left sidebar and scroll down to the Antepost section of the page, where you will find all the markets for this race. The Kentucky Derby is a Grade 1 race for three year olds held in Louisville, Kentucky. Inaugurated in 1875, the Kentucky Derby has been dubbed ‘the most exciting two minutes in sports’ and is the first leg of the US Triple Crown, followed by the Preakness Stakes and the Belmont Stakes later in the year. The race one and a quarter miles long and has purse of $2 million. Visit the Kentucky Derby’s official website to keep up with the race and the race’s wiki page to learn more about the event.